I thought of naming this post something along the lines of "The Successful Separating of 12 Eggs" but decided the name of the recipe was far more descriptive of what this post is actually about. My birthday was last Thursday, but I put off making anything because, I can't remember, I think I was lazy. I'm not terribly into birthdays, the only reason I made anything at all was because it was a great excuse. Plus, my birthday is the only time I can make any dessert I please and not ask R his opinion, which inevitably involves chocolate and rolling. 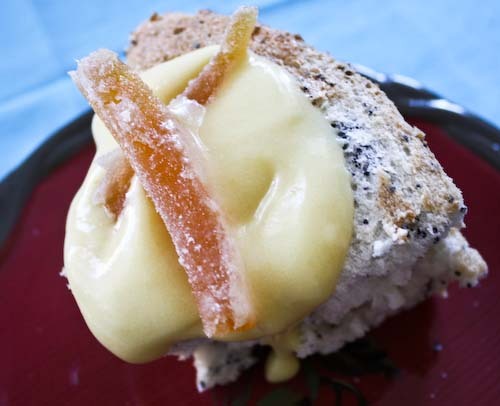 I personally love a good citrus dessert, and this is only possible when it's all up to me. So I wanted something I'd never tried making before, something that would be a challenge (at least for me) and something that had nothing to do with chocolate. I used to love angel food cake when I was little, I loved that it was light and sticky and that I could eat it forever and get sick with sugar before I actually got full (like a more solidify form of cotton candy). Plus the thought of all of those egg whites seemed a fitting enough challenge, plenty for a Saturday morning anyway. A few notes on the recipe, be sure to use cake flour and make extra sure that it's not the self-rising kind. Although you can often substitute self-rising for regular cake flour by eliminating the leavening agents like baking powder, baking soda and salt, angel food cake relies on the egg whites for its volume, so there's no substituting to be done. (Yes, I realize there's salt in it, but there's not much, and the cream of tartar is there to prevent crystallization and to help the whites reach their maximum potential). Also, this is a good time to follow that rule that I know we all know: separate your eggs into smaller bowls first, one at a time, and transfer the contents into larger bowls after each egg. That way, if a yolk contaminates a white, all you've lost is one egg, not a dozen. Because, of course, those finicky, high-maintenance whites will remain liquid if even the thought of fat or grease crosses their little minds. If you can't find superfine sugar, Alton says that you can wizz regular sugar in a food processor for two minutes instead. 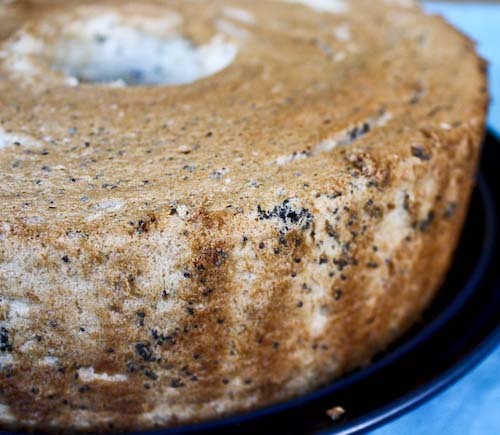 This seems to be a pretty standard angel food cake, other than the addition of the poppyseeds, which add a nice little crunch to the pillowy slices. Oven preheated to 350, be sure your 10" tube pan with a removable bottom is immaculately clean and ungreased. Sift the flour and 1/2 cup of the sugar together three times. With an electric mixer fitted with the whisk, whip the egg whites with the warm water until they are foamy. Add the cream of tartar and the salt and continue to whip until the soft peak stage. Gradually begin adding the remaining 1 cup of sugar and whip until the hard peak stage. Whip in the vanilla. Once the whites are whipped, Daley suggests using your hands to incorporate the flour mixture in 4 batches so as to deflate the egg whites as little as possible and to really feel when the lumps have been combined. This is great fun, so take her suggestion, but fold with care. When the final 1/4 batch of flour is almost incorporated, add the poppyseeds and fold to combine. Pour the batter into your waiting pan and smooth the top. Here, Daley suggests running a knife through the batter to deflate any air bubbles. I did it, so you should do it, too. Bake for 40-45 minutes, then cool the cake still in the pan, but turned upside down. I did this by setting it in a colander and it worked just fine. Be sure the pan is totally cool before you dislodge your cake by running a knife around the perimeter. 1 cup cold, unsalted butter cut into chunks. You're going to make this in a double boiler, so get the water gently simmering in your pot and have a sieve placed over a bowl all ready and waiting for you. In the bowl of the double boiler whisk the egg yolks until they are foamy then whisk in the rest of the ingredients other than the butter. Put the bowl on top of the simmering water and stir constantly. No, seriously, constantly. You don't want to end up with a bunch of cooked egg. Continue stirring until the mixture is thick enough to coat the back of a spoon, leaving a nice defined line when you draw your finger down it. This should take anywhere from 7-10 minutes. Once thickened, pour the curd through the waiting strainer and into the bowl. Stir the butter into the warm curd a few pieces at a time until all the butter has been combined. The butter cooled the curd down to lukewarm for me, so at this point, I simply covered it with plastic wrap so that the wrap was touching the top of the curd (to prevent a skin) and put it in the fridge. Keep it refrigerated for at least 2 hours, and up to 8. Drizzle as much grapefruit curd as you want over as large a slice of cake as you desire. If you have any grapefruit peels left over, may as well stick those on as well. I hope you had a great birthday, even if you're not really into it! I've always been put off angel food cake due to the sheer number of eggs required! Yours looks wonderful though and I like the grapefruit curd idea, never heard of that. ANGEL FOOD CAKE IS STILL ONE OF THINGS I WISH TO TRY I M A BIT WEARY OF IT THOUGH. YOUR CAKE LOOKS AWESOME AS USUAL. 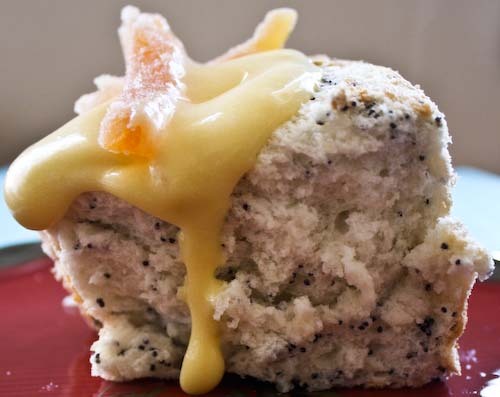 I LIKE THE GRAPEFRUIT AND POPPY SEED COMBINATION. This is such a lovely way to spruce up an ordinary angel food cake. 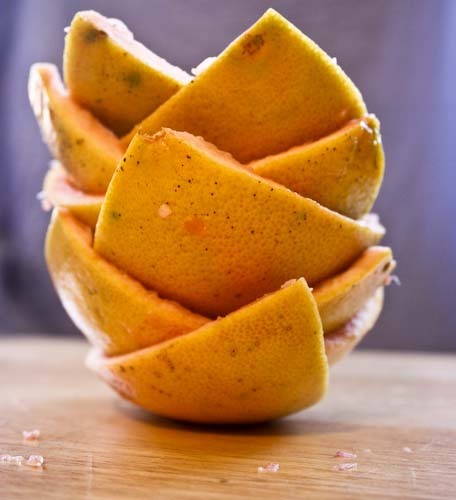 I love the pic of the grapefruit rinds too! The cake looks delicious! I love the addition of poppy seeds. Thanks Sam and Vera! I've now had my angel food cake fix for the next year. Snooky Doodle, it wasn't as hard as I thought it would be. And if I can do it, you can certainly do it. I'd love to see the creative things you could come up with for it! Susan, thanks so much for visiting! I could eat angel food plain, but the curd definitely added another layer! 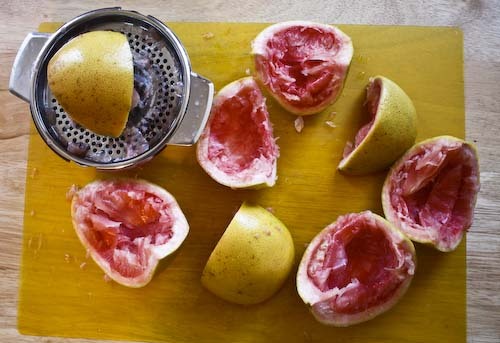 Mmmm, I love grapefruit, but have never considered making grapefruit curd. Now I have to try it! Oh, yum! I make grapefruit curd every year when we are gifted copious amounts of grapefruit from our friends abundant harvests. (Come to think of it...maybe grapefruit is the Zuchinni of the SW!) I'm bookmarking this cake so I remember to try it when I have all those grapefruits rolling around - it sounds delish!